Place any amount of money on the table. I’ll roll a fair, six-sided die. If it comes up 1 or 2, I’ll match your bet, and you get to keep it. If it’s 3 or over, you lose your money. We can play as many rounds as you want. (I hope) Your immediate response is “hell no.” Every 6 rolls, you should expect two wins. If you bet a dollar each time, you’ll win 2 and lose 4. Not a wise financial decision. Double your previous bet and go to step 2. Round 2: Bet a dollar. Lose. double it. Round 4: Bet a dollar. Lose. double it. Round 5: Bet 2 dollars. Lose. double it. Round 6: Bet 4 dollars. Lose. double it. Round 7: Bet 8 dollars. Win. Profit: 1 (8 - (4 + 2 + 1)). The system is setup so that each win guarantees you one extra dollar. This is clear if you tally up the money that you lose after each loss: 1, 3, 7, 15, 31…1 each is one less than the next bet, so every win will net you one dollar. Let’s break this down. Along the top, we have the chance of winning and the payout. Chance of winning is exactly what you think it is. In this case, .33 is 33%. The payout is how much money you win from a bet of one dollar. In this case, a payout of 1 means you win exactly however much you bet, so you bet $32 and win, you get $32 back. If the payout were 2, you would win two dollars for every one dollar you bet. Next we have the Rand function. 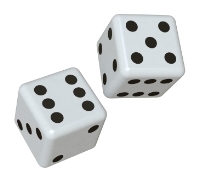 Essentially, this just chooses a random number between 0 and 1.3 I will use this to simulate rolling a die. “1” represents a win and a “0” represents a loss. Think about why that works for a second. If the random number generator picks a number between 0 and 1 randomly, we should expect it to be less than .33 a third of the time. This means that the “Win/Lose” column will be “1” a third of the time, which is the same frequency as the chance of winning. If you look back to the rules I spelled out, this should make sense. I also used an if statement for the return. Here, I am using “return” to mean how much you gained or lost from a specific bet. The if statement reads “If I won the bet, the return is the payout times however much I bet. If I lost the bet, the return is however much I bet times negative one.” Negative numbers represent lost money. The formulas above were copied all the way down, 10,000 cells later. Finally, we have the total profit. This is fairly simple to calculate: just add up the return column. Taken as a whole, this spreadsheet is a workable simulation of the betting. We can change the payout, the chance of winning, hit enter and see what happens. Again, your profit is in the thousands! Round 1: Bet 1 Dollar. Win. you have $51. Round 2: Bet 1 Dollar. Win. you have $52. Round 3: Bet 1 Dollar. Lose. you have $51. Round 4: Bet 2 Dollars. Lose. you have $49. Round 5: Bet 4 Dollars. Lose. you have $45. Round 6: Bet 8 Dollars. Lose. you have $37. Round 7: Bet 16 Dollars. Lose. you have $21. Now you’re in quite a predicament. As per the system, you should bet $32, but you only have $21. In this situation, you’ve basically lost. You have to make $29 more just to break even, and that seems unlikely. But that’s not how it’s supposed to work. I just made a spreadsheet that said you could make thousands with this. Why isn’t it working now? The answer, as you may have guessed, is that my simulation didn’t account for not having enough money to bet; I assumed you have an infinite amount of cash. So basically just add the previous bankroll and the return. Next, I’ll check if you have enough money to bet. Just to recap. In our betting game, you lose if you don’t have enough money to bet again, so if there’s a single “0” in the “Enough to bet?” column, you’ve lost. This is a countif function. It counts the number of cells that meet a certain criteria. In this case, it is counting the number of zeros in the “Enough to bet?” column. If this number is greater than 1, you lose. Not once, not twice, but 273 times you were unable to pay for the next bet. This makes sense if you think about it. Starting at $50 dollars, you only need to lose 5 bets in a row to be unable to pay. That may seem unlikely when you start the game, but eventually it will happen. And what do you stand to gain from this risk? Only one dollar per win. To simplify this, let’s say you are going to start with $50 and play until you win one dollar. There are two outcomes of this: 1. You lose 5 bets in a row, and lose $31. And 2. After losing between 0 and 4 rounds, you win one, and gain a single dollar. Say we were to play this game 243 times. We should expect to lose $31 thirty two times, and to gain one dollar 211 times. So every 243 games, you should expect to lose $781. For all practical purposes, this phrase is accurate. It’s impossible to gain a mathematical edge over an unfavorable betting game. Of course, it’s impossible to have infinite wealth in the real world, so it may seem pointless to add that asterisk, but from a mathematical perspective, it’s fairly interesting. Moral of the story: don’t play betting games with strangers. 3How it actually chooses this number and if it is truly random is a story for another time. 4Somehow, I ended this without mentioning that this betting system is called the "martingale Betting System"